Avoid hyperactivity at all costs. Varun suffered from a sneezing bout and breathlessness. The smoke from colourful crackers had taken its toll. ''Last year it got so bad that he had to be hospitalised,'' says Naina Aggarwal, his mother. 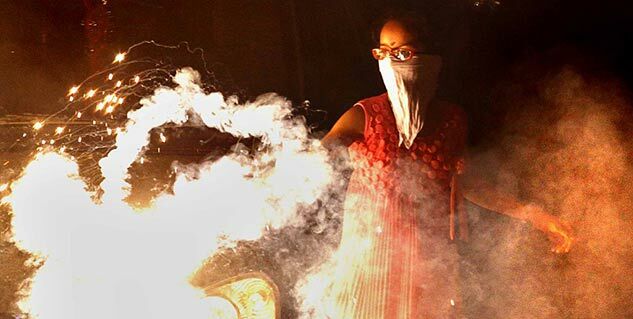 ''Usually we leave the city during Diwali, but this time we could not,'' she adds. For many parents like Naina and children like Varun, Diwali does not mean a long, happy vacation. It means scurrying out of the city far away from pollution. Asthma is a disease of the airways of lungs, characterised by increased sensitivity of the airways to a variety of triggers. It is generally an episodic disease, i.e., acute attacks followed by symptom-free periods. Though most attacks are generally short-lived, sometimes in severe cases it lasts for many hours or even days. For doctors, Diwali means a rise in the number of cases of respiratory disorders among children and asthma patients. Know how ginger can help you ease Asthma. The exact cause of asthma is not known. What all people with asthma have in common is chronic airway inflammation and excessive airway sensitivity to various triggers. "Asthma is caused due to allergy in the respiratory tract, which may be due to pollens, house dust-example mite, fungi, insects like cockroaches, mosquitoes etc. Nuts, eggs and in some cases milk can also cause allergy. These asthma manifestations are aggravated due to exposure to pollution, automobile exhaust, factory waste, foodgrain markets, harvesting seasons, viral infections, strong smells of paint, whitewashing etc. There are many other causes that can produce an acute asthma attack," says Dr S K Jain, senior consultant, pulmunology, Moolchand Medcity. Heightened Pollution Asthma patients are very sensitive to pollution. Bursting of crackers releases chemical fuels like SO2 and some other explosives which when inhaled can cause acute attack of asthma or worsen an existing one, especially when these chemicals are used in high concentration," adds Dr. Jain. Asthma as well as bronchitis patients must always carry along with them relieving medicines like inhaler and treat themselves when they develop symptoms. 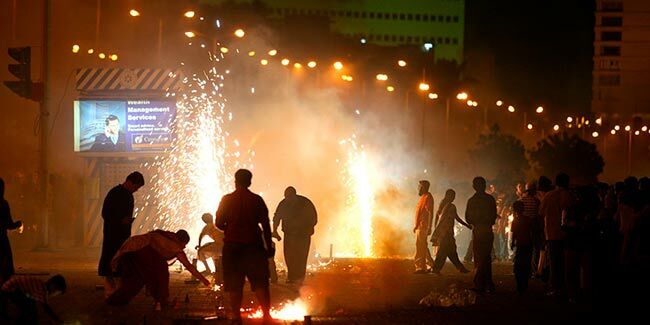 o Keep away from smoke and fumes that trouble you such as the smoke coming out of fireworks, burning of rubber tyres, garbage and dust clouds when streets are swept and the like. Sometimes inhaling of certain agarbattis (incense sticks) or strong kitchen smells might give trouble. Avoid sticky and constipating food. Eat plenty of salads and semi-cooked vegetables. Breakfast should contain mainly seasonal fruits. Highly polished rice, maida, potatoes and curds or yogurt are constipating. Avoid hyperacidity by drinking plenty of water to produce about two litres of urine in 24 hours irrespective of the season to keep the kidneys well-flushed. Practise pranayam (rhythmic yogic practice of breathing) daily and also have synchronized breathing while walking. Start inhaling for two steps, retaining for two steps and exhaling for two steps. After some practice increase to three steps and then four steps if possible but always adjust the count to suit you, that is, for some people, retaining the breath and/or inhaling may be for a step less or so, as one may find comfortable. While exercising also, breathe rhythmically. Celebrate an eco-friendly diwali this year. Stay indoors and keep yourselves on regular medication. If you see any acute and severe symptoms like cough, wheezing, breathlessness in spite of medication, immediately report at the nearest medical care centre for appropriate advice and treatment. Compromise. Know that your health is more important than just going out and bursting crackers. Asthma patients should take preventive medicines.Patients with severe asthma should keep an emergency plan handy especially during Diwali. Diwali is time for all of us to be in the mood of glea festivities, but asthma patients must be wary of certain things that can spoil their fun.